There are a great many home remedies suggested for sufferers of toenail fungus and even more people will agree that they are effective. Everything from soaking your feet in Listerine or vinegar to applying Vicks VapoRub, bleach, peroxide or various essential oils to the affected area are circulating out there. Whereas the intelligence behind putting bleach directly on your skin is questionable, there are online-forums-worth of people who will swear by this and other methods. The theory behind many of these treatments is that the fungus requires a certain environment to grow in, which includes a favorable pH level. Soaking your feet in something like a solution of vinegar and water would alter that pH level rather drastically and make the growing environment more hostile. One problem with this particular method is that soaking your whole foot in vinegar changes the pH in every area your skin comes into contact with the solution, which frequently dries out the skin, leaving it more prone to infection. A viable alternative is to soak a cotton ball in vinegar and place that on the affected area for 15-20 minutes. This isolates the vinegar to the places it is most needed and doesn’t damage the healthy skin surrounding the infection. This technique also works with the suggestion of Listerine. 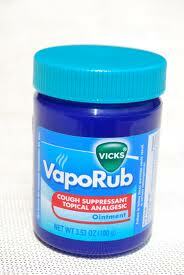 “Why Vicks VapoRub?” many people ask. The common theory is that it has to do with the eucalyptus in the product. The results are fairly unanimous from those who have tried it, it really works to clear up toenail fungus, and works fast. If you choose this method, you must cover the entire affected area and rub the compound in well. Reports state that the infection starts to clear up within days. Using rubbing alcohol or peroxide, applied to the nail, the surrounding area and under the nail bed if possible, are two other very common remedies. The likelihood of irritation is fairly high with these two but they have also been proven effective at killing toenail fungus. All of the remedies listed here have shown to be effective at slowing, killing and/or removing toenail fungus. But, as when using any home remedy, you must use a bit of common sense. If the infection gets worse or if the skin around the infected nail becomes irritated and infected as well, stop treatment immediately and see your doctor. Most of these remedies are for the early stages of toenail fungal infections and should not be started if your toe is already oozing pus or if the nail has separated from the nail bed. Again, if this is your situation, contact your health care professional right away.